Word-Whores: Favorite Childhood Book Pick! During this season of many holidays, the Word Whores are discussing what childhood book favorite would we gift to a kid today. My answer immediately popped into my head, but I set it aside to mull others. Why that book? Maybe I should pick something more... what? Feminist or something science fiction or fantasy. Some unusual book that would make me -- oh, right. I was falling into that trap of wanting to sound all smart in my choices. So, here it is, and I don't care if it IS a princess book! 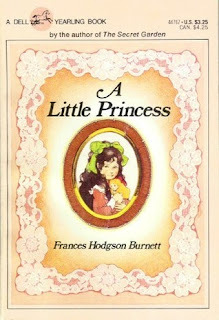 A LITTLE PRINCESS was one of the formative books of my early childhood. So many of my ideas about story and the true meaning of being a princess - a gracious behavior that comes from the heart and not from circumstance - were formed by this book. From looking it up, I see that it's discussed as a fairy tale derived allegory, so I suppose it's no surprise this book sang to me. And, in fact, clearly set the foundation for me to love Jane Austen, the Bronte Sisters and so many more of that tradition. In fact, I'm buying a copy for my granddaughter for Christmas. I feel like I should now comb through the Twelve Kingdoms novels for hidden references to this book and write a scholarly treatise LOL. that would be highly entertaining, though I'm sure your time could be better spent! Procrastinating - one of my many skills LOL! heh, well as procrastination projects go, that's a good one! Your pick doesn't surprise me at all...and fits in so well with your Twelve Kingdom series. do you think so? how interesting! now I kind of want you all to dissect it and tel me what you see! We will need some wine for that.